CrossFit was introduced to me at a time when I needed a lifestyle change. In 2009, I was introduced to this “new style of working out” called CrossFit and my friends and I created our own WODs for us to do at the track of the high school we work at. Our equipment was limited, so my first experiences with CrossFit involved a lot of running, lunging, squatting and box jumping. Regardless of our limitations, I was way ahead of the game by the time I decided I wanted to take CrossFit seriously and join a gym as far as movement and technique were concerned. From the first WOD I was hooked and there was no looking back. Within about a year and a half, I went from casual CrossFitter to competitive athlete to CrossFit trainer. CrossFit is no longer a hobby or my workout, it is now my life and my passion. CrossFit dares me to push past my limits, and my mental toughness grows with every physical gain I make. Now, the best part of my day is when I walk into the gym and hear “3,2,1…go.” To say that CrossFit has changed my life is an understatement. 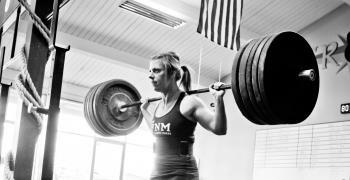 CrossFit challenges me to be the best possible version of myself. Through CrossFit, I found that hard work, mental toughness and a little grit can transform one’s body, mind and spirit. My outlook on fitness and nutrition has forever been changed. Over the years I have maintained a clean diet through both paleo and flexible eating. I have recently found that after my first pregnancy that my personal nutrition is constantly evolving. If something nutritionally is not working for me anymore, I change it. I have experimented with Paleo and Zone and more recently Flexible Eating. The process has forced me to take a hard look at the impact that both micro and macro nutrients play in my training and my overall health. Flexible eating allows me to use both paleo and clean eats to fuel my fitness. Depending on my current goals, my flexible eating numbers can change. As a CrossFit coach and athlete, I have made a commitment to not only push myself to my limits but hope that my fit lifestyle inspires others to do the same. Qualifying as an individual female in the 2012 and 2013 CrossFit Opens is an accomplishment that I hold as one of the greatest of my life, but opting to compete as part of the CrossFit North Marin Regionals team in 2011, 2012 and 2013 has given me experiences and memories that I wouldn’t trade for the world.